It's the 30 year anniversary of the "I Believe" run. Tallassee football fans remember that season when Tallassee marched all the way to the state semifinals. 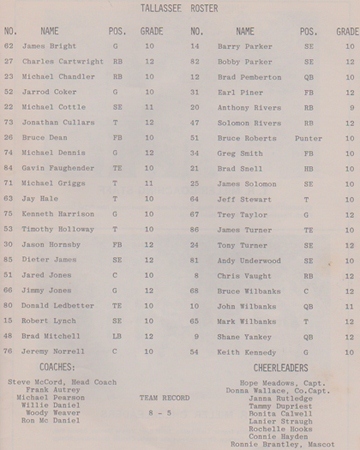 The 1984 season ended in Brewton with a 17-7 loss to T. R. Miller. Miller defeated Cherokee County the next week to win the Class 4A state championship. 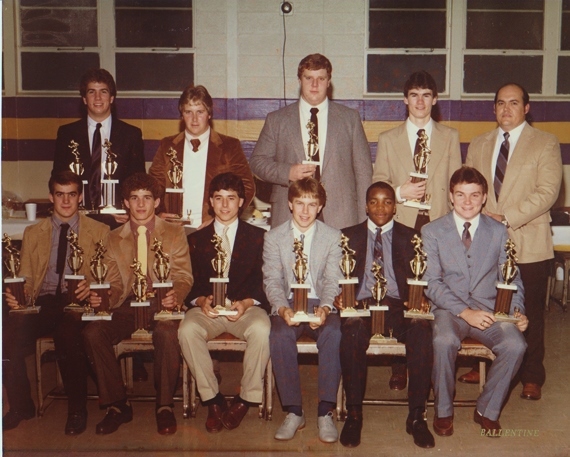 The '84 Tallassee team, coached by first year coach Steve McCord, made the playoffs with a 5-5 regular season record. The first round game was a decisive 41-14 win at LaFayette. The Tigers avenged a 34-20 loss in week two to Handley with a 28-21 win in round two. On an icy night in Fayette, Tallassee topped Fayette County under first year coach Walden Tucker 28-7 in the quarterfinals. 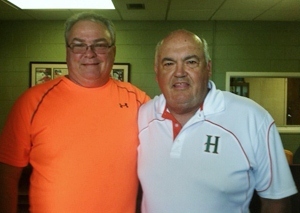 Tucker went on to coach 26 years at Fayette County. "It was a great atmosphere in this town at the time," Trey Taylor recalled. Taylor was a senior. "Every store in Tallassee was painted up. There was great spirit. Everybody traveled when we went on the road. We just ran into a buzzsaw at T. R. Miller." 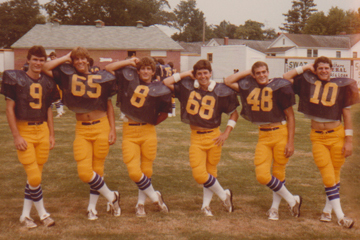 Shane Yankey was also a senior on the '84 squad. "The one thing I remember about that year is we would get there about an hour early and walk the field. I couldn't tell you how many times when we got off the bus and walked the field, the stands were already full. That's how much this town supported the team." "I knew Tallassee had some good talent returning," McCord said of the team coached by Marc Rice the previous season which went 8-2-1. "It was a little difficult coming in without a spring. We had some good skill players with Shane Yankey, Solomon Rivers, Earl Piner and Chris Vaught. We had a little bit of size. We knew we had potential." As the team rolled, the fan support grew through the playoffs. Trey Taylor was a senior on the '84 team. McCord is back in coaching at Hooper Academy this season. This is his 33rd year as a head coach. "Tallassee's always been a great supporter of their athletic programs," McCord continued. "We had a great following whether we were at home or on the road. We had a great fan base." As for the game semis in Brewton, McCord still remembers like it was yesterday. "We felt like whomever came out of that game would be the winner. It was our state championship shot," the coach stated. "We went in a little banged up. Earl Piner, our fullback, didn't get to play. We had some unfortunate mistakes. We dropped a touchdown pass. We fumbled once down close. You hated to see it end there. It's just a shame that we couldn't go on the next week and wrap it up." The trip to the semifinals was unprecedented for a Tallassee team. It has only been matched once since with the 1999 squad. 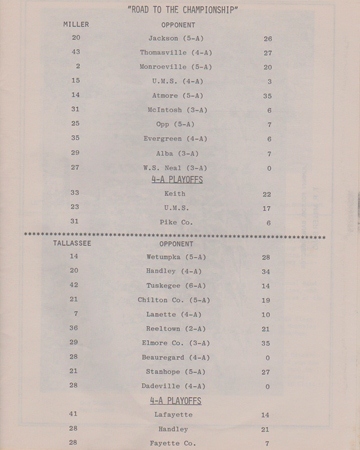 That THS team under Mark Rose lost by a score of 28-14 to Jemison, a team coached by Steve McCord. "I thought that was our best game. It just happened against Tallassee," said McCord. "People have asked me if it was some kind of 'sweet revenge.' It had nothing to do with that. It was just another game for me. 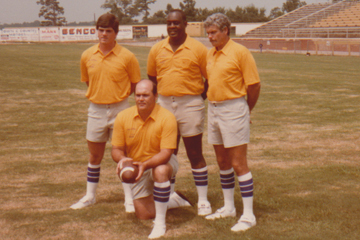 I really respected the people of Tallassee and the players there." 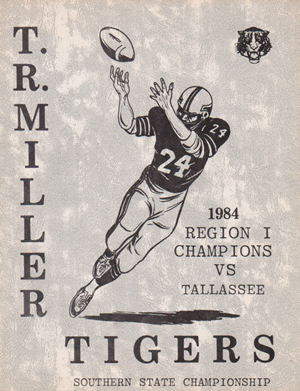 On Friday night, the 2014 Tallassee Tigers return to Brewton to face T. R. Miller in the first regular season meeting between the schools. T. R. Miller is 3-0 in the series with THS. In addition to the 1984 victory, second round wins came in 1996 (39-13) and 1998 (37-8). 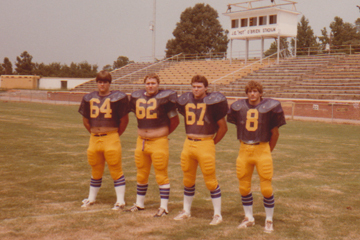 Current Miller coach Jamie Riggs has been at the helm at his alma mater since 1989. In 26 seasons, his record is 273-57 in Brewton. Riggs has won four state championships. His 66 post-season wins is tops among high school coaches. Tallassee coach Mike Battles and Riggs have known each other for years. "The great thing about playing them win or lose is you'll know where your weaknesses are before you start region play," Battles said. Kickoff is 7:00 on Friday night, Aug. 22. 1300 WTLS/106.5 FM will broadcast live at 6:00 p.m. with the PrimeSouth Bank Pregame Show. Audio will be simulcast on Bright House Networks Cable TV Channel 97. Video streaming will be on Tallassee Times TV followed by the "Scoreboard Show" until 11:00 p.m.
Read more about Tallassee's season opening victory over Notasulga in this week's Sports. Michael "Grits" Dennis - "We all hung together like brothers. The coaches pushed us beyond belief. At times you wanted to kill them. Now you look back and you were glad to have them. That was one of the most heartbreaking things I've ever been through. When that buzzer went off, you knew that was your last ball game. Chris Vaught was kind of the glue. He might not have been the star, but he gave it his all." Jimmy Jones - "We had 16 seniors. We had been through a lot. 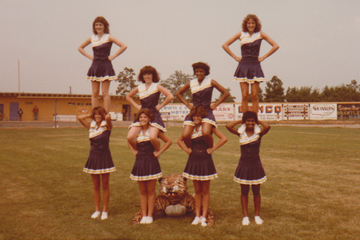 It was Coach McCord's first year. We had Coach Rice for two seasons. He prepped us for that. It took us half a season to gel with Coach McCord. The biggest key was the leadership of people like Solomon Rivers, Chris Vaught, Brad Mitchell, Bruce Wilbanks and Shane Yankey. That whole group of seniors played hard and did things the right way."